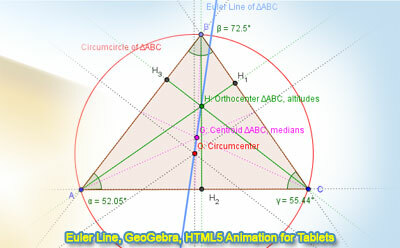 GeoGebra Dynamic Geometry: Euler Line of a Triangle, Orthocenter, Centroid, Circumcenter. HTML5 Animation for Tablets (iPad, Nexus..). Level: School, College, Mathematics Education. Distance learning. The interactive figure above, created with GeoGebra, shows a triangle ABC with the Euler Line HGO. In a triangle ABC, the orthocenter H, centroid G, and circumcenter O always lie on a straight line, called the Euler line.